Rusting classic cars and trucks offer glimpse of the past in the Great Northwest. Dave Kennett of Washington State has watched a yard full of vintage iron, from the 1920s through 1940s, slowly morph into the lush, green landscape. Kennett has driven by the acres of farmland, which sits 12 miles south of the Canadian border, for several decades. He finally decided to stop and snap a few photos of some of the antique vehicles that litter the property. 1920s Model A Ford parked for decades just outside a barn in Deming, Washington. "They've been there all my life," Kennett said. "I've never talked to the owners but I'm guessing that the family was into logging, way back when they were cutting down huge trees there." Several complete body shells on frames are scattered beyond the barbed wire fence along Mosquito Lake Road in Deming, Washington. Heavy duty vehicles, including what may be a 1921 Schacht 5-ton truck (top photo), appear to have been parked and forgotten. Most wear period-correct rims and tires. Who knows how many project cars could be started with these mostly complete chassis? How about a parts run for your next rat rod? A pair of 1920s-era Model A Ford work trucks are posted near a fence line on Mosquito Lake Road in Deming, Washington. A 1938 Buick, covered by brush and moss, still has air in its skinny, right front tire. 1947 Austin A40 Devon, an import from Great Britain. Kennett, no stranger to old cars, has spotted many would-be dream cars on his travels into California and Canada. He didn't have to go far to find these. Sometimes the most interesting finds are in your own backyard. 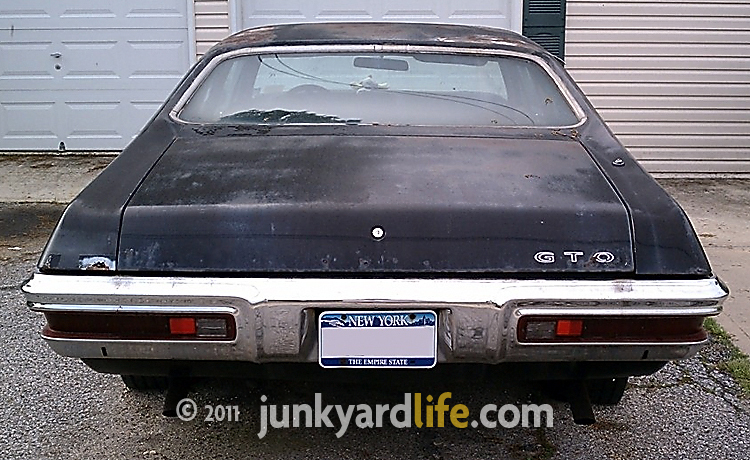 Share car finds from your neighborhood and see your photos and stories on junkyardlife. 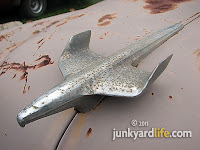 Email me at junkyardbull@gmail.com. Gang, it looks like we got a mystery on our hands! Look what I found. It’s a pink 1953 Chevrolet in really great shape. Clearly, it has not spent its life in the elements. The owner said it’s a 1953 Business Sedan that he found in northern Birmingham, Alabama. He also revealed that the previous owners’ grandparents dated in the car. Way cool so far, but the current owner wouldn’t provide any further information. A quick walk around led to an interesting clue. The tail lights indicated that this 2-door Chevrolet was a 1954 model. What gives? It’s not uncommon in automotive history to be fooled by the tail light stamping. Many times the next model year would use the same tail light lenses as the previous. Not the next year! Are we to believe in 1953 this car traveled to the future and used the next model year’s tail lights? So what do we have here? A mystery! We junkyardlife guys can always rely on the trusting cowl tag for information….or can we? As I pulled the mask off this pink villain, he turned out to be NOT a Business Coupe, but a once beautiful 1953 Chevrolet 2-door Bel-Air Sedan. From its birth in St. Louis, Missouri to the present, it had evidence of several different paint schemes over the years. We here at junkyardlife love the numbers. That will reveal the original paint color, right? Wrong. It had a paint code of 526 clearly stamped on the cowl tag. I looked very hard and could not find a corresponding color. I was about to re-visit the car and double check for researcher dyslexia when I came across a '53 Chevy forum from 2009 where an enthusiast was restoring an exact copy of the same car I had found. That '53 had the same cowl tag codes as this car and he also could not find paint code 526. 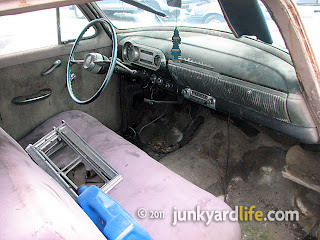 Interior of the 1953 Chevrolet reveals seemingly solid floor pans. Alright, let’s look for clues. I'll take the hot chicks and go this way. 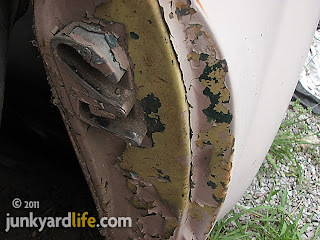 The online ’53 Chevrolet forum concluded that the paint code was probably mislabeled 526 instead of the correct 516 when the stampings were entered by hand at some point at the factory. Paint code 516 was India Ivory and Sun Gold. What a beautiful color combination that was! Two tone paint schemes sold very well and that combination was a very happy color that assured junkyardlife galoots to be in a good mood just glancing at it in a parking lot. The interior (code 247) was a light green ladder pattern that doesn’t exactly harmonize with the yellow and white but was popular in the 1950’s. 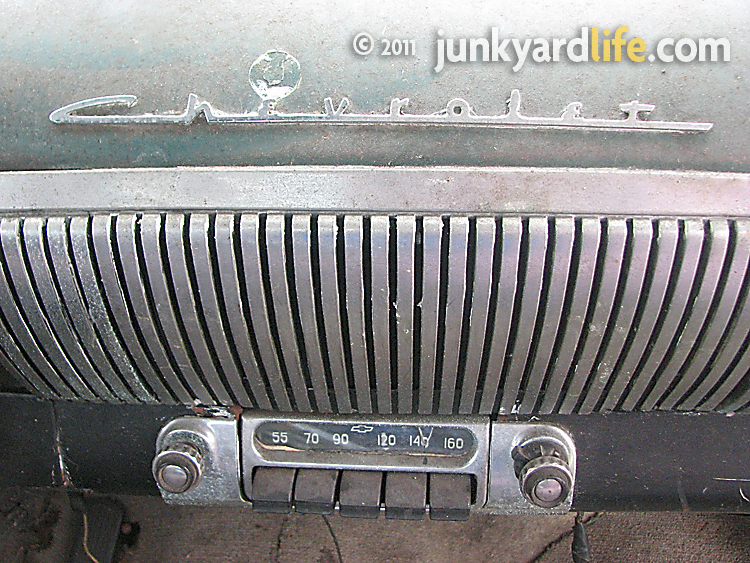 This ’53 Chevy was born in St. Louis, Missouri. It makes you wonder how many “mistakes” there were. Don’t they make a lot of beer in that same city? That’s something to think about. Sun Gold Yellow lurks behind thick layers of pink paint on this '53 Chevy. Chevrolet made a lot of Bel-Airs in 1953. So what makes a Bel-Air special? It cost a little more money due to having more trim adorning the car, especially around the windows. Not counting station wagons, 150s, or the most popular 210 models – Chevy built a total of 513,779 Bel-Airs in two-door, four-door, convertible, hard-top and sedan bodies. 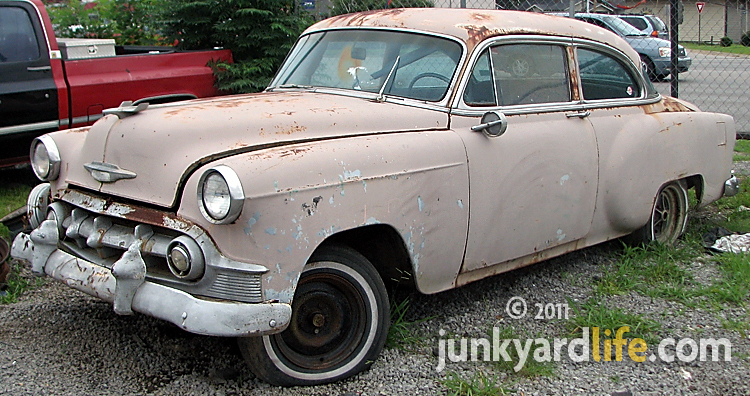 The numbers reveal that this ‘53 Bel-Air 2-door post sedan is one of 144,401 built. That would indicate that there should be lots of these babies around but that is not the case. Few of the 1953 models have survived the six decades since they were built. Their younger brothers, the Tri-Five Chevys (1955-’57), get all the glory. 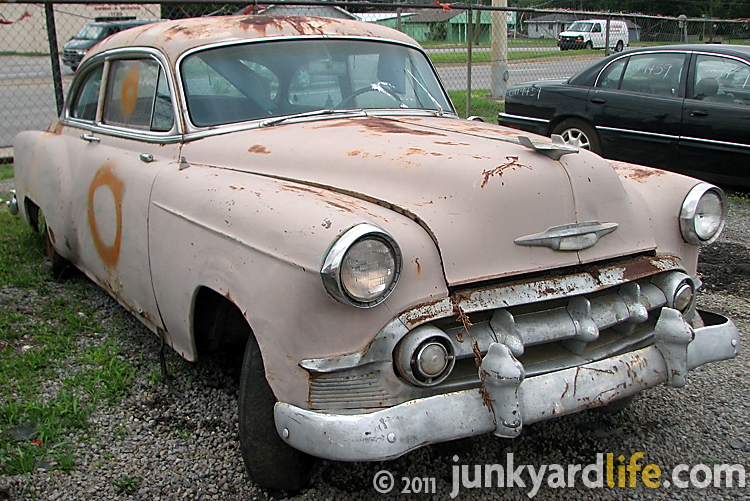 Even four-door rust buckets of those models get restored, nevertheless 1953 was a special year for Chevrolet. It was the year that the Corvette was introduced to the world and Chevrolet’s Powerglide automatic transmission was making a name for itself. Life was good and only going to get better. 1953 Chevrolet Bel Air 2-door post. So another interesting car with its mysterious paint code and tail lights from the future. Hopefully this beautiful post car will fall into the right hands and once again grace the highways in some form or another. It’s our job here at junkyardlife to make sure these pieces of American history do not get turned into soda cans or siding. Do what you can to help. Find it, buy it, bring it home, fix it and hit the road. See the USA in your Chevrolet indeed. 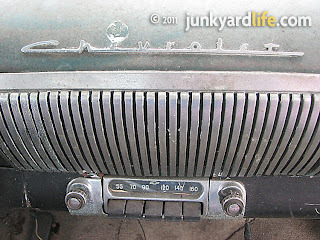 Original 1953 Delco Model 986668 AM radio fills up a lot of room behind the shiny dash. 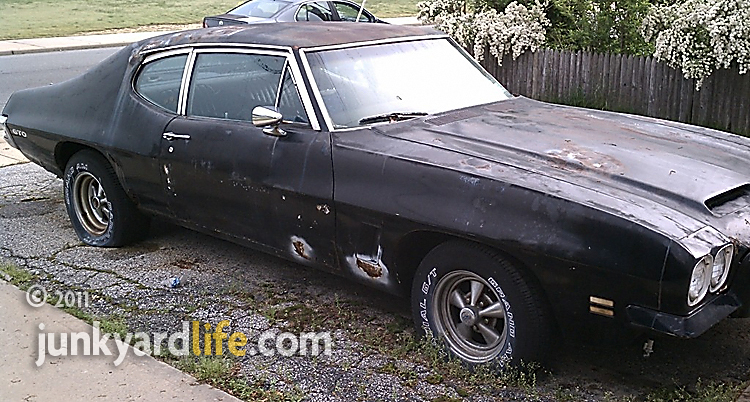 Rare 1972 Pontiac a 'post'er child for neglect. 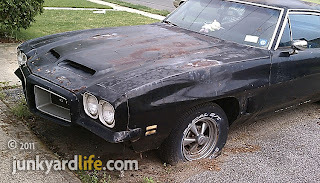 Gary K., a 28-year-old fan of classic American muscle cars, from Long Island, New York tried to rescue this 1972 Pontiac GTO that he found languishing in his suburban neighborhood. 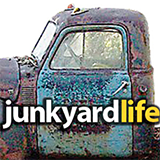 Gary is a junkyardlife kind of guy. When he finds a classic car sitting outside, he wants to find out the car's story and possibly work a deal to purchase the car and save it from the elements. Twin scoops adorn this 1972 Pontiac GTO's hood. 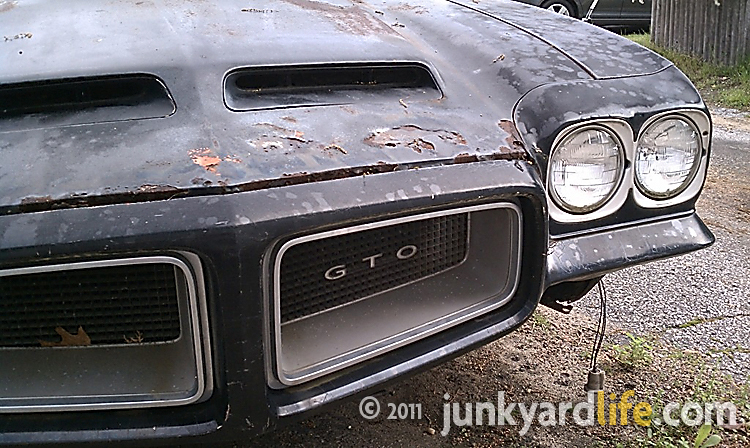 "From the looks of it, this GTO has been sitting for a very long time and it is almost not worth saving judging by the amount of body rot," said Gary. After a quick glimpse at the neglected, low-production muscle car, Gary jumped into action. "I tried to contact the owner," said Gary. "I left notes in the mailbox and rang the doorbell multiple times but to no avail." Gary came away empty-handed but luckily for us, he took his camera and delivered these photos to junkyardlife. Dig the Cragar SS rims on the 1972 Goat! Finding a 1972 Pontiac muscle car parked outdoors on four flat tires is a rare site indeed. Pontiac sold 134 ‘post’ coupe GTOs among the 5,807 total GTOs built during the 1972 production year. GTO coupes featured a window frame around the door glass and a post at the leading edge of the rear seat's side window. When the GTO's windows are rolled down a chrome post is visible. Drag racers favored the post cars for their more rigid chassis. Prudent buyers liked the solid seal between the door glass and rear window that the pillared coupes offered. 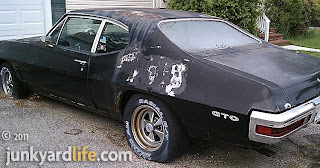 In 1971, Pontiac offered the T-37 or GT-37 optioned LeMans, which featured the GTO's performance in a 'sleeper,' coupe body, but by 1972 only the Pontiac LeMans GT in coupe or hardtop was available for buyers to get the GTO power on the cheap. The choices were narrowed but it's anybody's guess as to why 134 GTO buyers opted for the 'cheap' look. This rotting Pontiac GTO also features a special order paint color for 1972. The buyer paid an extra $115 for menacing Starlight Black paint. Who's the cheapskate now? Notice the 1972 GTO's optional passenger's side, chromed rear view mirror? 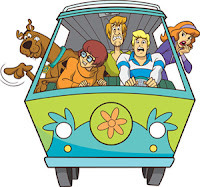 The VIN # shows the car was built with a 400 engine. Inside an automatic transmission with console shifter is nestled between the bucket seats. The optional formula steering wheel is icing on the cake. 1970-72 Pontiac GTO's and LeMan's featured these distinctive tail lights. Thanks Gary! 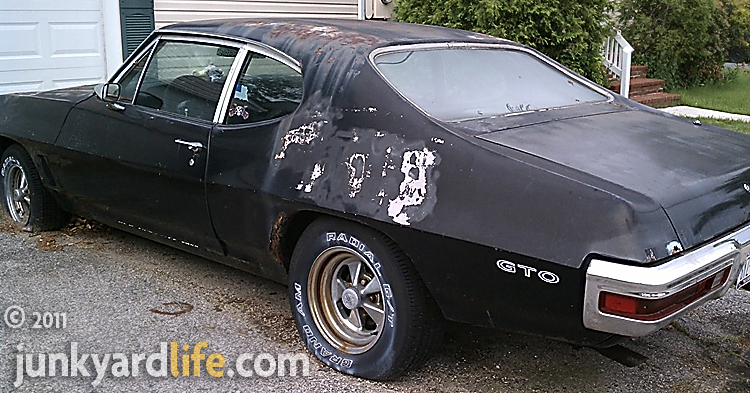 We may not have seen the last of this ’72 GTO judging by Gary's enthusiasm to save this Pontiac. "This is a SUPER RARE goat from the last days of the muscle car wars and it's just rusting into the ground," Gary said. When Gary locates a distressed classic car he usually turns it into a restoration project, then resells it. Sometimes that comes back to bite him. He is still kicking himself for selling his first car. "I worked on my 1971 Chevelle SS convertible all through high school then sold it years later, which I regret dearly," said Gary. I hope someone rescues this rare Goat before it's too late.